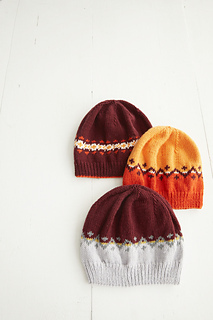 These Fair Isle-banded beanies put a bright pop on top of any guy or gal’s look. Each features a different colorwork design and is knit flat from the k1, p1 ribbed edge to the rounded crown. A color-tipped edge adorns the darker style.